Learn how to grow pecan trees. Planting and growing pecan trees is easy but it requires lot of space as the tree grows tall and wide. Pecan trees are native to America and Mexico and grow mostly in Georgia and grows in Florida to Illinois, even to the west of Texas. 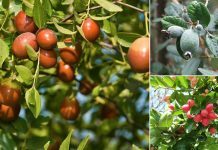 Pecan trees are rather large, a mature pecan tree can grow up to 40 m tall with a spread of 12 – 20 m. If you’ve large yard you can grow pecan trees as they are not suitable for small backyards or garden. These trees are the source of many medium-sized pecans that are eaten fresh or used to create sweet desserts and candies, including pecan pie, caramel-pecan tarts, pecan pie, pecan pralines and many others. Before planting remove all the dead and entangled roots and prune off 1/2 part of the plant. This will encourage the vigorous growth and healthy roots. Space candy pecan no closer than 40 feet (if planting in a garden). For planting pecan trees in orchard, a suitable distance is 40 – 50 feet. Grow at least two pecan trees to ensure that most of flowers produce nuts. Although self-pollination in candy pecan is possible, but it is preferred that at least two or three trees are planted nearby for maximum nut production. For planting pecan tree, dig a hole at least 2 feet wide and 2 feet deep as pecan trees have extensive root system. Fill the hole with well-drained soil. Pecan trees can generally be grown easily and efficiently in a variety of soil types, except the soil which drains poorly. Location should be sunny and open as pecan tree spreads a lot and grow taller. Growing pecan trees is possible in variety of soil types, but for optimum growth soil should be well drained, deep and rich in organic matter with pH level slightly acidic to neutral. Pecan tree grows in slightly moist soil. Regular and deep watering is important for growing pecan trees. In first three years water deeply, once a week (avoid during rain), reduce watering in winter. 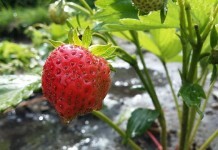 During fruit production watering should be increased. In the spring fertilize it with compost or farm manure, also apply fertilizer that is rich in potassium and phosphorus around the tree, 5-10-15 is suitable. 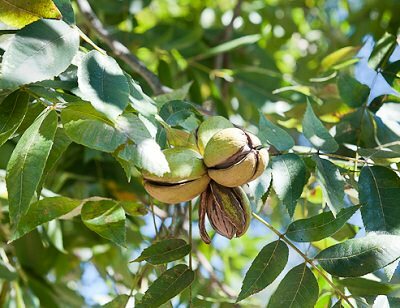 After first year of planting, apply balanced fertilizer in spring and in summer use zinc sulphate, which is essential for healthy growth and production of pecan trees. Mulching is important for pecan trees as they require evenly moist soil, mulching also reduces the competitive weeds. A grafted tree start to produce fruit in 3 to 4 years after planting. 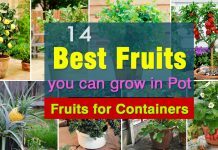 It is an alternate fruit bearing tree, it means it bears heavy fruit one year and light in the next year. Pecan trees bear fruits in fall and are ready to harvest when the husk loose its green color and start to split. Powdery mildew, bacterial leaf scorch, scab, anthracnose and kernel rot are common pecan tree diseases. Pecan nut casebearer, aphids and pecan weevil are the pests that attacks it. For diseases, pecan tree should be treated with fungicides. Continual look out for pests like aphids and their removal using appropriate pesticide is also important. Whereas, weevils can be controlled by traps.